Since 1947, MI-DEL has been satisfying sweet appetites with healthful, natural, and delicious taste. easy to just grab while shopping. You learn to really appreciate products that both taste good & are easy when you are gluten free. With MI-DEL you get both. We always have a bag of MI-DEL Chocolate Chip cookies, and Arrowroot Animal Crackers in the pantry. For those who are Gluten -Free, the MI-DEL Cinnamon & Ginger Snaps make a great replacement for graham cracker crust pies! MI-DEL thankfully offers Gluten-Free, but that's not all they offer. They have a line of Naturals & Organics that you're sure to love if you don't need GF. * Make sure to take advantage of the FREE milk offer on the MI-DEL home page! 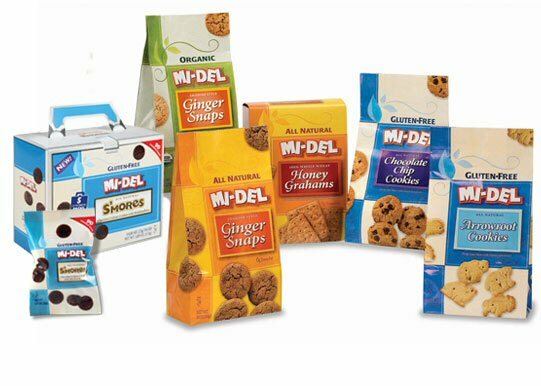 You can purchase MI-DEL cookies at a retailer near you, or online at Amazon. 3 Winners will receive a coupon for a FREE MI-DEL product of their choice! *Follow me @jamaise at Twitter & Tweet this : RT @jamaise #GIVEAWAY #WIN MI-DEL~ All Natural & Organic or Gluten Free Cookies~ 3 Winners!~ http://bit.ly/rpwVWu ~Ends 9/22 tweet each day for one entry each ! I'd like to try the Maple Munchies. I follow through Google Friend Connect. I entered the riceworks giveaway. I would love to try the all natural chocolate snaps. I'd like to try the Mi DEL Smores! I'm a chocolate lover. YUM! I'm also a GFC. Thanks! I follow your blog. I'd like to try the gluten-free chocolate chip cookies. Thanks.